A shower is a shower. It is a more or less wily “gadget” that eases our life: water runs down on the sweaty and dirty people with considerable pressure. There are those who prefer the bathtub, but the bathtub only delays the procedure which can be completed more quickly in the shower. Everybody takes the shower for granted and nobody questions the shower unless of course it drips, when it is seen as bothersome and a plumber is called in. 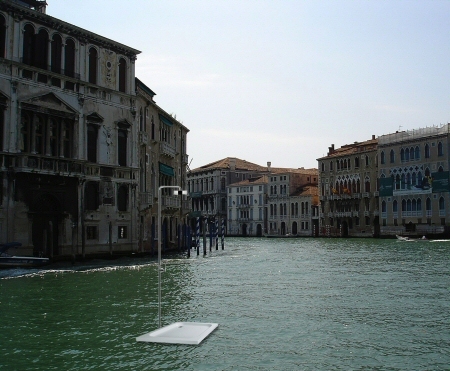 The shower is part of household furnishings, but the artist transposes it into the Venetian canal network. Here the water runs day and night from the faucet of the artificial shower. Nobody can take a shower in the canal. Wrenched away from its everyday surroundings, away from the place to which it “belongs”, lo and behold, it turns into an exhibit! But it functions even when exhibited: like an absurd fountain in the dirty and no longer cleansing water.